Tomato Avocado Feta Crostini. A simple, light fresh & delicious appetizer. Tomato Avocado Feta Crostini. A simple, light fresh and delicious appetizer course, hors d’oeuvre, or even a light lunch. A friend was throwing a dinner party and I was helping him plan the menu. The first course he had planned though, seemed far too heavy to me for the main course that he planned to serve afterward. An appetizer course should whet the appetite and not satisfy it. It should be a harbinger of good things to come. The way to do that is to keep it small, fresh, simple and delicious. When I asked what he had on hand in the fridge, he listed a number of things, including the ingredients for this straightforward recipe. I made this suggestion to him and next morning he called to say that it was a great success. He also said I was absolutely right, keeping the appetizer small and simple worked much better with the heavier main course. To learn how I make homemade garlic oil for this recipe and so much more, take a look at this post for Homemade Garlic Oil and Flatbreads. This Tomato Avocado Feta Crostini recipe is a quick, fresh idea for a simple starter course or hors d’oeuvre that’s perfect for a casual summer barbecue or dinner party. It’s also perfect for a light lunch. Instead of plating this as an appetizer, I sometimes chop the ingredients a little smaller and set a small bowl of it in the centre of a serving platter along with a small jug of the balsamic syrup. 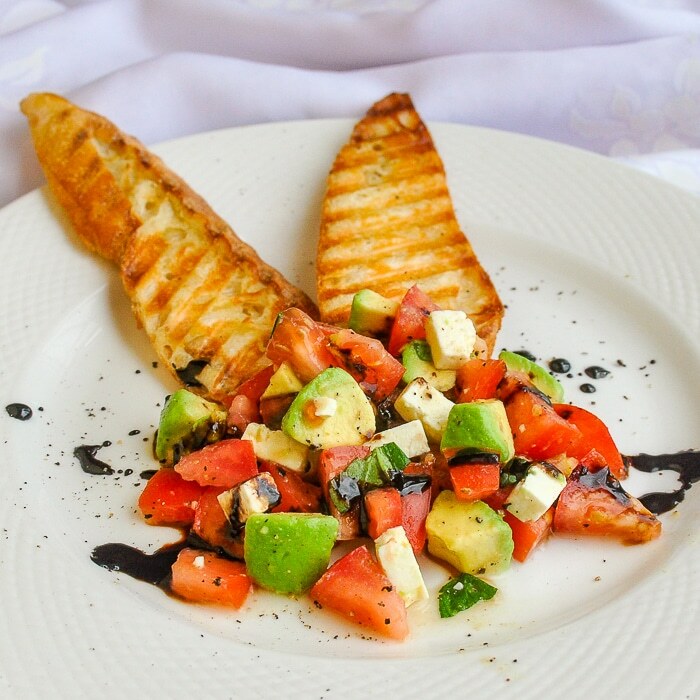 The crostini are then placed around the salad and guests can spoon the salad onto the crostini and drizzle the balsamic reduction themselves. 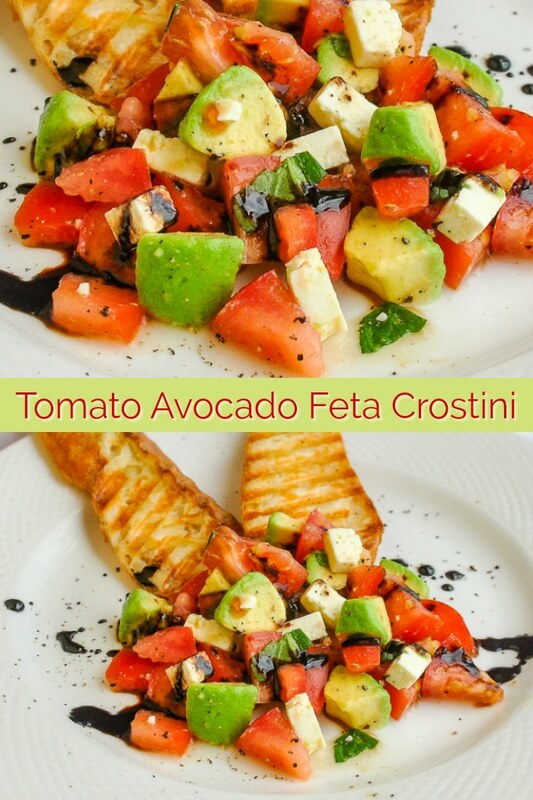 Like this Tomato Avocado Feta Crostini recipe? Be sure to browse the photo index of delicious dishes in our Healthy Eating Category. 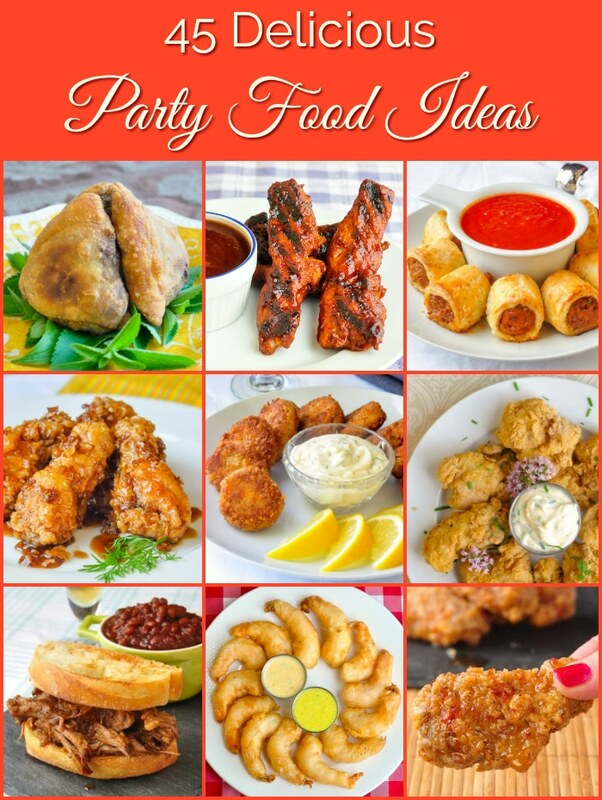 If you like these sorts of recipes be sure to browse through this collection of 45 Great Party Food Ideas. Our best hors d’oeuvres, finger foods and delicious nibbles to make every occasion from Super Bowl Game Day to a Holiday season party the tastiest of the year. Originally published May 2011. Updated January 2019 to include a printable recipe card & nutritional information. Tomato Avocado Feta Crostini. A simple, light fresh and delicious appetizer course, hors d'oeuvre, or even a light lunch. Simply toss all ingredients together and chill until ready to serve. 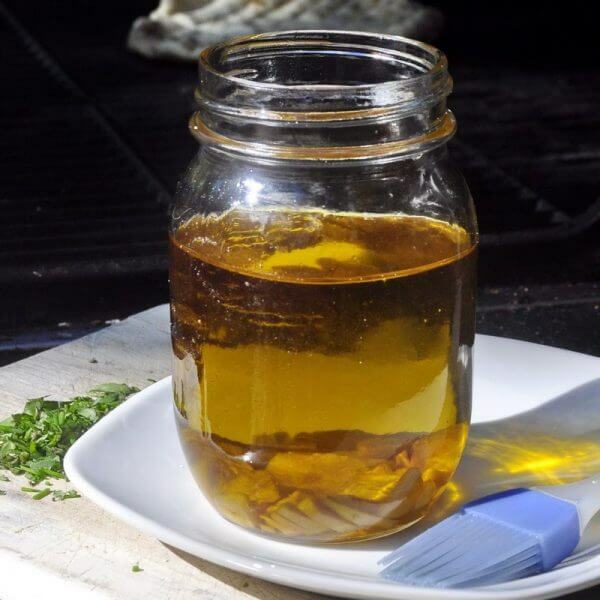 Simply brush garlic oil on both sides of the bread and then toast them in a panini press or under the broiler. Simmer together until large bubbles form and the liquid coats the back of a metal spoon. 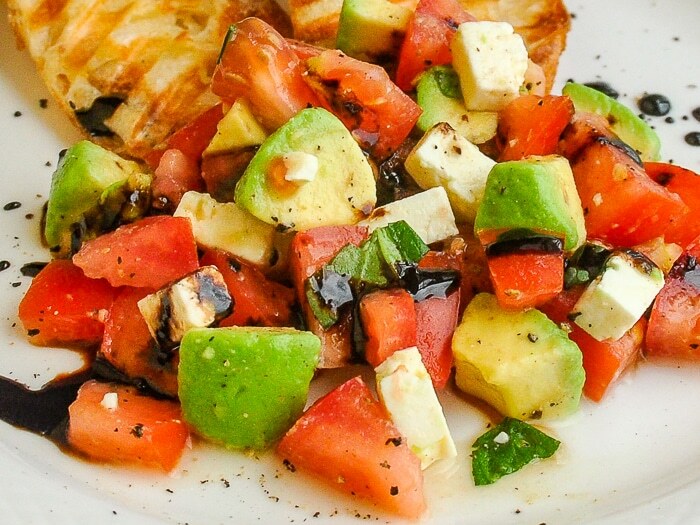 Drizzle over the tomato, avocado and feta topping. I thought this recipe looked delightful for a light lunch – and I had all the ingredients, including a reduction and home-grown basil! So rare. Anyway, I started putting it all together. After stirring in the feta, I said, “uh oh.” Really strong and I felt like I had made a mistake. Tasted it and KNEW I had blown it. But I continued forward, not wanting to waste such lovely ingredients, and I have to tell you. We sprinkled on the balsamic reduction and experienced a flavor epiphany. The flavor change was instantaneous and glorious, and I am so glad we didn’t back off. Trust the recipe! Trust Barry Parsons! Thank you for the wonderful lunch.